Some time ago, and after much counseling, prayer, and research, we decided to adopt three children internationally. We had adopted previously, and were familiar with the process, and felt prepared for this new challenge. The international adoption had the usual roller coaster of highs and lows familiar to this community–delayed paperwork, the joy of meeting your children in an orphanage, mountains of expenses, and miracles in fundraising. We pored over all the information we had on the sibling group, and felt an incredible bond with them as we spent a week in their city. We knew the children had developmental delays due to neglect, but none had been diagnosed with any major challenge. We felt confident we could give the children a better life, and that although things would be challenging, things would work out. Things did not work out. The oldest child, a preteen, suffered from attachment disorder. She began to attack other people in the home, including small children to whom she was not biologically related, run away intending to kill herself, and self-harm. This consumed our lives. Counseling and medication helped decrease the frequency of her episodes, but they occurred regularly, sometimes daily. A frequent trigger was my wife’s attention to anyone else, so much that a conversation with someone other than her would trigger violence or flight. If I was not home, we had to find another adult male to be in the home in case she became violent, as my wife was not physically strong enough to handle her. 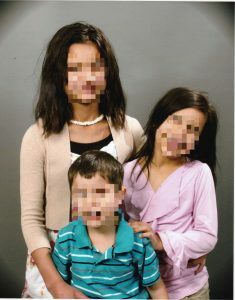 The other two children had similar, albeit less severe issues. At some sad point during this process, we came to realize that the children would do better in a home without any non-biological siblings, or at least no siblings younger than the preteen girl. The very real potential for violence was too strong. We spoke with the people at Second Chance, who said based on their experience children often centered their problems on the first family to adopt them, and that they would hardly even say goodbye when the time came. This was exactly what happened. A wonderful couple in another state, without any children, responded to the listing. We reviewed their home study, met over the phone, felt good, and moved forward with the legal work. When their joyful day came, the children transitioned without hardly a second glance backward, despite consuming our lives for so long. We had a short transition period in which I stayed with them and the new family, and helped them get to know each other. After court, their new family began. And they’ve been doing amazing. The preteen girl has reduced her violent episodes to about one every other month in the new home, which is simply amazing. What was sometimes every day for us has calmed itself dramatically, as she no longer has the constant trigger of mother paying attention to non-biological siblings. The predictions of the Second Chance workers were correct, to the last detail I can recall. In the end, we felt our role was to bring them to the United States and help them find this home, where they are thriving. The Second Chance program was a blessing from God. While the act of placing one’s children for adoption is heartbreaking, we cannot deny that they simply have a stronger chance for a better life in this new home. There is significant stigma in some parts of the adoption community about this act, of finding someplace adopted children will have better lives, but our experience showed that sometimes the best interest of the children is not to be a “forever” family. We were a step on their journey, and now they’ve found a home.